What really helps your students learn science: Labs? Group work? Certain types of problems or test questions? Something you never even thought about? Find out with data that go way beyond what standardized test scores tell you. The Feedback Loop describes a process by which you design formative assessments of what you do and collect a variety of forms of data. Then, the book shows you ways to actually use the information to improve your teaching. Written by veteran classroom teachers, the guide offers practical ideas for middle and high school teachers, regardless of discipline. 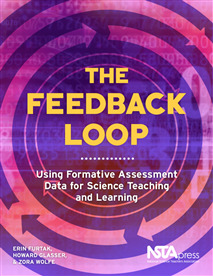 The first chapters introduce the Feedback Loop framework; highlight the four elements of goals, tools, data, and inferences; and explore how to close the loop by connecting inferences and goals through feedback. Later chapters show how to use the full loop to inform your instruction. The book supports the Next Generation Science Standards and includes classroom vignettes that ground the ideas in real-life situations. Meant to illuminate without overwhelming you, The Feedback Loop’s data-driven approach will support student learning and help strengthen your teaching practice in your very next lesson or unit.